“Problem Solvers” is a monthly feature in which pest management professionals share stories of some of their most difficult accounts — and how they conquered them. If you’re interested in sharing your story, please contact Senior Editor Will Nepper at wnepper@northcoastmedia.net. Fig. 1. A typical cleanout. 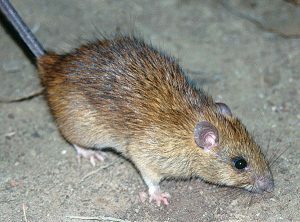 I was called in by a high-end golf course community for a roof rat (Rattus rattus) problem. The Homeowners Association (HOA) was ready to expand into an office building near the main entrance of the country club. The building had originally been a convenience store. Upon inspection of the building I found two toilets, centrally located, that had been dry for two years. 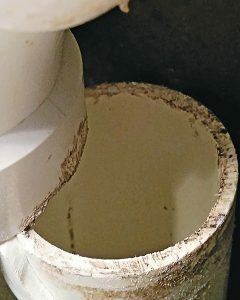 The rats had nearly chewed through the 2-in.-thick wooden doors, and the toilets were destroyed by chewing and sebum (the rats’ oily, waxy skin secretions). There were traps and evidence of bait blocks, along with several dead rodents in the attic. The various control devices had three different company logos, so the problem was treated at least that many times during the two years the building had been vacant. The job was obviously going to be a challenge, so we priced accordingly. For the initial service, I filled the toilets with water, and placed 24 traps. Six were outside in bait stations and 18 were placed in the drop ceiling in several locations. In the twice-weekly follow-up visits, 26 rats were trapped in 14 days. The third week was quiet, so an exterior exclusion was performed. The fourth week surprised me a bit: We caught seven large male rats, five of which were removed from the attic near the bathroom. Knowing the territorial nature of this species, seven alpha-sized males trapped in such a short time told me there was a serious problem. With a total catch of 33 rats within four weeks, I was baffled as to how these pests were finding enough food in an empty building. The source of a roof rat problem in a vacant building took several weeks to smoke out. After notifying the HOA of my findings, I convinced them to allow an investigation of the sewer system. They were hesitant at first, but agreed after assurance the mystery could be solved this way. The plumbers were scheduled two days later, and the real work began. 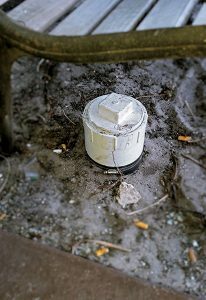 The first step to testing the sewer system was finding a main clean-out cap (see Fig. 1). After two hours of camera work, a locater device found the cap — 3 ft. underneath a large bush. When we removed the cap, we found a dry sewer line with rat feces visible inside. Now the lines could be filled with smoke from outside the building. The smoke first appeared in the hallways, coming straight through the carpet on the floor! It turns out that floor drains from the old store had been carpeted over. With that much smoke escaping the system, a proper test could not be achieved. The carpet was cut, and the floor drains sealed. Fig. 2. Note the bite marks on the pipe. We restarted the test and immediately, smoke appeared from the attic where the five male rats had been removed. The smoke was so thick, I had to use a blower to clear it out and start again. This time, with my head in the attic, I saw the smoke rise from a small cubbyhole between the two bathroom doors. Below the attic, this spot was a flat wall. We cut a hole into the wall and discovered an inset drinking fountain that had been removed. The drain line was left open and provided a hidden entry from the sewer (see Fig. 2). The plumbers capped the drain, and I caught two more rats that week. The building is now the sales office for the HOA. To my knowledge, the problem never returned. I have personally performed more than 50 rat services in that community. I believe some communities have increased activity because of the high populations in the sewer and other utility service lines. It seems to be prevalent in neighborhoods connected to major roads, and worse near entrances and dead-end streets or cul-de-sacs. As pest management professionals, we deal with mysterious problems regularly. The answers to these issues are not always visible. Occasionally, the answers are what lie beneath the walls, floors, and the very dirt we stand on. Contact Contributor Joe Wludyga, president of A Wludyga Pest Solution in Palm Beach, Fla., at joewludyga1@gmail.com.